The University of Maryland’s Colvin Institute of Real Estate Development honored five outstanding individuals on March 6, 2018 for their innovative and entrepreneurial approaches to real estate development. The 2018 Innovation and Entrepreneurship in Real Estate Awards recognized Horning Brothers’ Joseph Horning and David Roodberg, Kelly Sweeny McShane, Abraham Rosenthal and Adrian Washington for their outstanding work in revitalization and placemaking, creative problem-solving, collaboration and long-term solutions to urban challenges in the state, region and beyond. Sonia Hirt, Dean of the University of Maryland School of Architecture, Planning and Preservation [MAPP] opened the evening by celebrating the multi-disciplinary nature of real estate development. The event is sponsored by MAPP in conjunction with the Robert H. Smith School of Business and the A. James Clark School of Engineering. The awards were presented by UMD’s Chief Strategy Officer for Economic Development Ken Ulman and Michael E. Johnson, Principal of UrbanCore Development LLC (and a past award-recipient) served as Master of Ceremonies. This year’s honorees excel in different aspects of real estate and offer diverse perspectives, but all strive to create vibrant, economically and socially responsible assets that enhance the built and natural environment. Joseph Horning, Founder of Horning Brothers and David Roodberg, CEO and President, accepted an award on behalf of Horning Brothers. Founded more than 60 years ago, Horning Brothers engages in innovative and impactful real estate projects; they entered areas of The District of Columbia when most people were fleeing to the suburbs. Their projects have helped transform the H Street corridor and Columbia Heights areas into the sought-after neighborhoods they are today. Their newest project in Ward 8—Stanton Square—will provide both market rate and affordable housing. Kelly Sweeney McShane has dedicated her 20+ year career to providing assistance, opportunity and support to low-income families and the homeless through Community of Hope (COH). Collaborating with developers, stakeholders and other service industries, Kelly has spearheaded The Commons at Stanton Square, working collaboratively with Horning Brothers and Martha’s Table to bring social, behavioral and medical support services for area families. Kelly was honored for her tireless efforts to improve the lives of homeless and low-income families’ her entrepreneurial skills that have grown COH to a $19million annual budget with a focus on innovative system change. 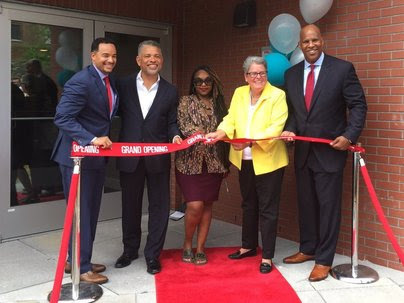 Adrian Washington is known as founder of D.C.’s Neighborhood Development Company (NDC), a real estate development company focusing on revitalizing emerging urban neighborhoods while preserving existing culture and diversity. Adrian’s award was in honor of his many creative and transformative real estate projects in emerging neighborhoods, and for his leadership in transforming the Anacostia Waterfront. Adrian has been a major asset to the university and the real estate program since 2008, providing guest lectures, mentorship and site visits for students and faculty. A forty-year veteran of real estate development and architecture, Abraham Rosenthal capitalizes on creative problem-solving to create exciting mixed use and retail properties, such as Canton Crossing and McHenry Row. His creative financing skills find ways to create new and exciting community-enhancing properties. Abe is a UMD graduate in architecture and an adjunct professor for UMD’s Real Estate Development Program. The evening kicked off with a keynote address by journalist Daniel Brook, who recently released his book, A History of Future Cities. Bringing the history, design and culture of global cities—Dubai, Shanghai, Mumbai and St. Petersburg—to the audience, Brook’s keynote discussed what matters to real estate with a unique and unexpected twist. Real estate professionals from all sectors of the industry, government leaders, along with administrators, faculty, alumni and students attended the dinner and awards ceremony to pay homage to the honorees and support future leaders in the profession. Proceeds from the event go towards scholarships for UMD’s Real Estate Development Program, one of only twenty-five multi-disciplinary real estate programs in the U.S.